This year marked the tenth anniversary of the Flora in Winter event at the Worcester Art Museum. As part of this event, several special festivities and lectures were offered to the public. 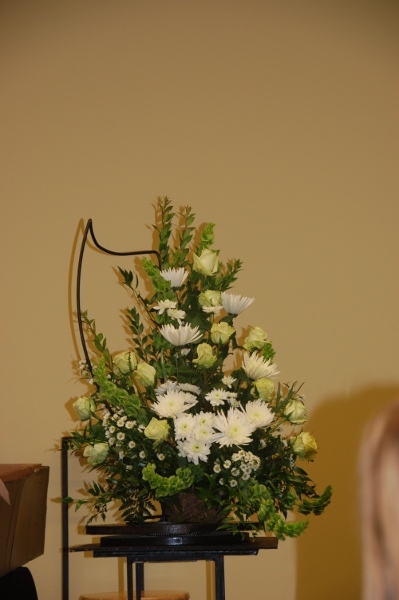 One of these events was a floral demonstration by Ann McDevitt, a Scottish floral designer who owns and operates her own business Flowers from the Heart in Sutton, Massachusetts. 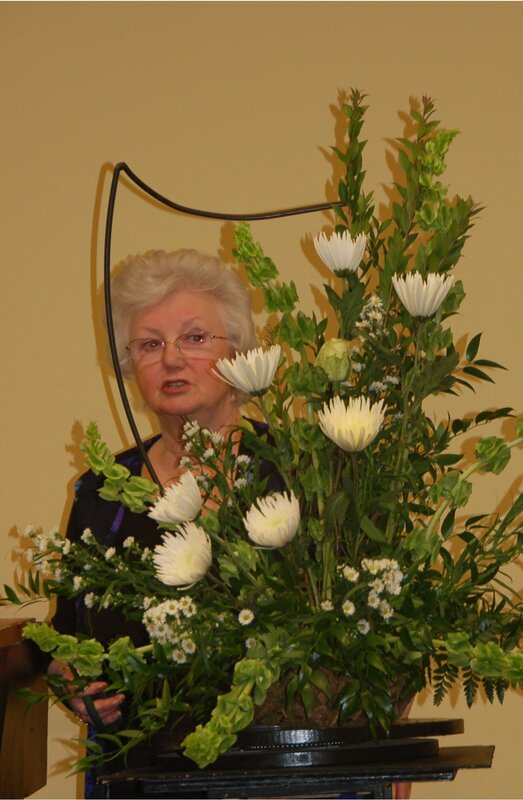 From the start, Ann regaled and delighted her audience with her Scottish humor and stories of her adventures as a floral designer over the past twenty years. 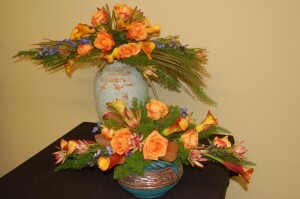 She came to floral design later in life, taking night classes in her native Scotland. She has competed in many competitions and flower shows across Britain, winning several first, second, and third place prizes. Most notably, she has designed flower arrangements for Queen Elizabeth II and the late Princess Diana. These experiences led to invitations to give workshops across Britain, Europe, and the United States. In her demonstration at the Worcester Art Museum, Ann took us on a tour of Ireland, Spain, Russia, and Tunisia through her floral arrangements. Although Ann is Scottish, her mother was from Ireland and she took Ann and her siblings to Ireland to visit when they were children. As Ann told us about these trips, she put together an asymetrical arrangement of myrtle, Bells of Ireland, green tea roses, and white mums evoking the feeling of Ireland. Ann explained that one of the differences between the floral competitions in Great Britain and the United States is that in Britain there are twenty entries per class whereas in the U.S. there are four. 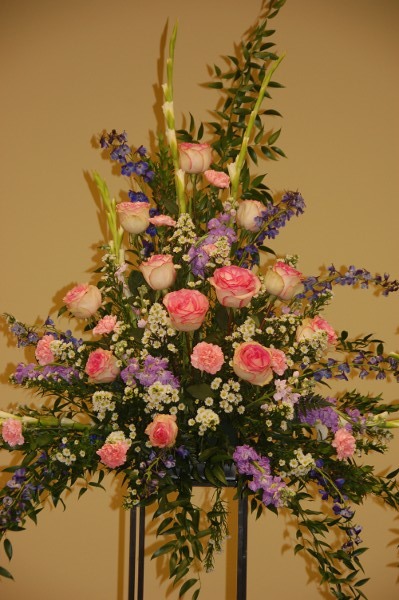 At one of the competitions, she met Julia Clements, also known as Lady Seton, who is considered the founder of floral arranging. Lady Seton, who died last year at the age of 104, was a writer and public speaker who promoted floral arranging to the women of Britain after World War II as a way to lift their spriits and bring beauty into their homes during a time of austerity and rationing. Amazingly, she had had no previous experience other than a memory of floral arrangements she had seen on a visit to the States. In the early 1990′s, Ann also met Nina Losolivia, the President of the Russian Flower Arranging Clubs, at a national competition and was subsequently invited to come to Russia to give workshops. After the bleakness of daily life in the Soviet Union, the Russian women were enthusiastic about flower arranging and eager to learn as much as they could from Ann. As a thank you gift, Ann was presented with a samovar, which is a Russian tea urn. Using this samovar, she created her next arrangement with a Russian theme in a Hogarth’s Curve design, which is “S” shaped. This arrangement consisted of myrtle, red and pink roses, and orchids. Next, Ann took us to Spain. 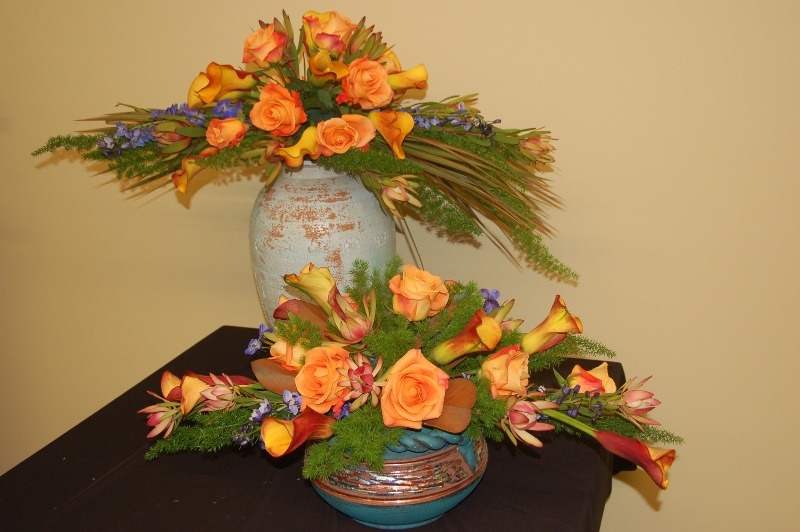 The horizontal arrangement of oranges, yellows, greens, and purples was created with dressina, ming fern, leucadendron, calla lillies, delphiniums, and spectacular orange roses known as “Voodoo”. Then we were off to Tunisia, which Ann visited on a vacation. She went to a souk, or marketplace, where she came across some birdcages that she knew she could use in a floral arrangement. They were too expensive for her budget, but the woman merchant made a deal with Ann by looking in Ann’s purse and taking her cosmetics as payment! 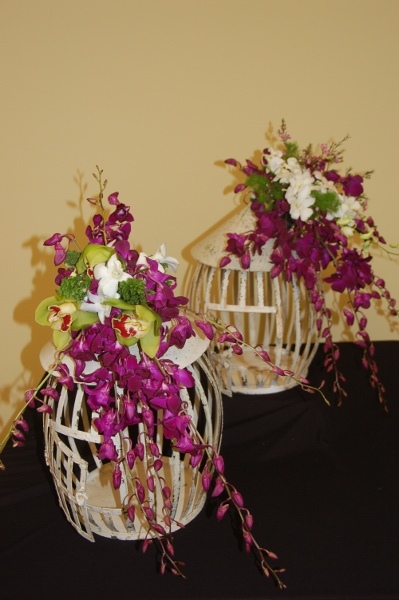 For the floral arrangement, Ann attached the flowers to the top of the birdcage. A combination of purple singapore, white narcissus called entropia, and pink stephanotis nicely draped over the side of the birdcage. The two-hour demonstration ended with a show-stopping traditional triangle arrangement. 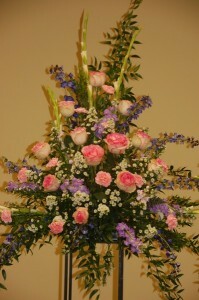 Easily three feet high, the arrangement included esperance roses (pink and cream combination), purple stock, pink carnations, and purple delphiniums. 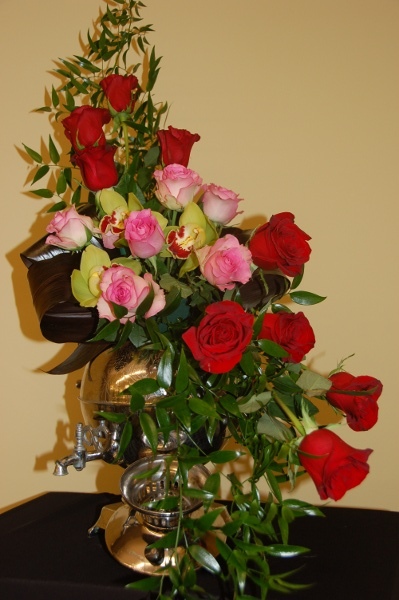 An arrangement fit for a queen! While assembling this arrangement, Ann talked about meeting Queen Elizabeth, who she says is barely over five feet tall, quite small for someone with such an imposing presence. She said that when the queen or Princess Diana wanted flowers from her, it would be one of the ladies in waiting who would call. She did receive wonderful handwritten thank you letters from Princess Diana who Ann said was a truly warm human being. I was so impressed with the time and energy Ann put into this demonstration. She had spent the better part of the previous week going to the market in Boston to buy flowers, preparing and preserving the flowers for each arrangement, and then setting up for the demonstration. Ann is in her seventies, but she could easily outdo many half her age in energy and vitality. She donated her time to the museum for this event and we were the richer for it . If you ever get the chance to see Ann giving a demonstration, I encourage you to go – you’ll have a great time!